Earth, also known as Sol III, known in the Forerunner era as "Erde-Tyrene" (pronounced "Er-da-ty-reen") or "Erda", is the third planet and one of four terrestrial worlds of the Sol system. 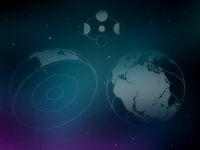 It is the presumptive homeworld of the human species, though this was disputed by some ancient humans, due to the loss of records to technological dark ages and the presence of human ruins on other worlds. It is the current capital world of the Unified Earth Government, and home to the headquarters of the UNSC. With a population of around ten billion, Earth was the most populated planet in UEG territory prior to the Covenant invasion. Despite being dramatically reduced during the Covenant attack in 2552 due to both casualties inflicted by the Covenant and a major evacuation effort, the population had again risen to several billion by the end of 2553. 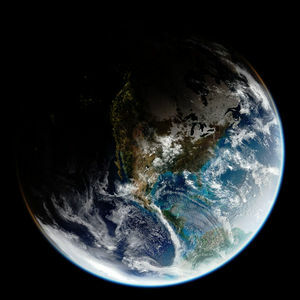 It is believed that Earth first formed about 4.6 billion years ago, and gave rise to the first single-celled organisms about 3.9 billion years ago. Before the discovery of records of ancient spacefaring humans, it was believed the ancestors of modern humans, "Homo sapiens", first evolved in Africa around 200,000 years ago. This date has recently been called into question largely thanks to the Bornstellar relation, the remains of a deceased Catalog unit, and a damaged monitor, which revealed that humanity achieved its earliest known spacefaring technological state prior to 1,100,000 BCE and that Forerunners believed humans had "moved their interstellar civilization outward along the galactic arm" by 150,000 BCE. Not only is the dating for humanity's origin less sure now, but the very idea of Earth has humanity's birthplace has also been revealed to have been a matter of debate for the civilization that preceded and witnessed the human-Forerunner wars and some Forerunners. That ancient empire had lost many of the records that could have proven or disproven the issue, and human ruins had also been discovered on multiple worlds beside Earth from forgotten eras of prehistory. Regardless of when and how humanity first evolved and developed, it is clear that humans were present on multiple planets over a million years ago, and it was not until thousands of years into this civilization that leading human scientists traced the species' origins to Earth. Spreading across the Orion Arm of the Milky Way Galaxy, humanity underwent several periods of technological and social regression, losing most of their records in the process. Earth was one of the first human worlds to fall to the Forerunners in the human-Forerunner wars. After being defeated by the Forerunner civilization, most humans were exiled to Earth, with their civilization dismantled, populations splintered amongst the many human species and their culture degrading back to a primitive state for millennia. Earth and humanity came under the charge of the Forerunner Lifeshaper, the Librarian, who helped the humans slowly work towards rebuilding a primitive civilization. Remnants of their former technology, such as steam power and hot-air balloon flight, were re-learned under her care but later forgotten after the firing of the Halo Array. Mount Kilimanjaro moments before the Halo effect reaches Earth. Near the end of their war with the Flood, the Forerunners, specifically the Lifeworkers under the direction of the Librarian, indexed many of Earth's species - including humans - as a part of their Conservation Measure to preserve life in the galaxy after the activation of the Halo Array. Prior to the activation, after surveying the planet, beacons were activated informing humans imprinted with the Librarian's geas to gather to evacuate the planet. Lifeworkers only had time to evacuate one out of a thousand of the planet's large species; countless species would be left behind. Several days into the evacuation the Librarian and IsoDidact arrived in the system to speak with Catalog. The evacuation was halted ahead of schedule as the Flood had broken through the local Forerunner defenses and were entering the system. After the Ur-Didact composed most of the human population on Omega Halo, the Librarian realized the remaining population would not be enough to repopulate the species. She sent Chant-to-Green to see how much the Flood had taken in the system and save whatever humans she could. The Flood had left Earth untouched after the Forerunners evacuated. Chant was only able to gather a few hundred humans to send to Installation 00. When Precursor star roads began to appear in the system, she told Chant she would stay on Earth and gave Chant the title of Lifeshaper. Later, a Gargantua-class transport arrived to be disassembled and reconfigured, and after gathering the necessary materials, formed a portal to the Ark. After the Array's activation, human life was planted back on Earth, where it successfully re-developed. By the year 1914, much of the world was divided into two factions, the Triple Entente, or Allies: the United Kingdom, France, Russia, and later the United States of America, and the Triple Alliance, or Central Powers: Germany, Austria-Hungary, and other nations of similar ideals. The Central Powers were defeated at the end of World War I in 1918, resulting in a decade of prosperity for the Allies, followed by an economic depression and the rise of Fascism, Nazism, and Communism in many countries. In 1939, another World War erupted, between the Allies (Britain, the Soviet Union, later the United States, and many other nations) and the Axis (Nazi Germany, Fascist Italy, and the Empire of Japan). In 1945, the Allies defeated the Axis. Later that year, the victorious nations, in an attempt to prevent more World Wars, founded the United Nations, an international assembly of peaceful nations, whose goal was to settle international disputes peacefully, and was the predecessor to the UNSC. In 1957, humanity finally made their way into space with unmanned probes and by 1961, humans themselves had gone into space. In 1969, humanity had finally stepped on an extraterrestrial surface-Earth's Moon. In March–June 2160, Jovian Frieden secessionists attacked United Nations Colonial Advisors on the moon Io, which led to three months of fighting between the Earth military and Jovian Frieden forces. National governments began to support their own colonies which sparked proxy wars off-planet, leading to tension and militarization on Earth. In 2162, armed conflict ripped through South America, starting the Rain Forest Wars, as Koslovic, Frieden, and UN forces all clashed over ideological differences, sparking additional conflicts off-planet. In December of 2163, the three factions clashed, this time on Mars. This was the first extraterrestrial use of Marines, who launched lightning raids on Koslovic positions, permanently affecting military doctrine for centuries. In 2164, UN forces began a massive military build-up and began the first true interplanetary war. The forces of the fledgling United Nations Space Command were significantly bolstered by a massive propaganda campaign running on the victories on Mars and over the next six years took back the Sol system and drove the dissident factions to destruction. Now with a massive military with no enemy to fight, overpopulation, famine, and a collapsing economy, the newly unified Earth faced an uncertain future. Humanity would enter a period of peaceful stability for the next two hundred years, until civil unrest began to spread in the Outer Colonies, with various groups seeking secession from Earth and the UEG. The scale of the unrest would steadily rise, soon becoming a major threat to the UEG's existence. This provoked the UNSC to initiate the ORION Project and later the SPARTAN-II program in order to create powerful shock troops to quell the escalating Insurrection. All this was suddenly and violently rendered a moot point when a single alien ship made an unprovoked attack on the colony of Harvest; humanity's first encounter with an alien civilization - the Covenant. Over the next twenty-seven years, humanity would wage a brutal war for survival, losing hundreds of colonies, including virtually all of the Outer Colonies in 2536; and on August 31, 2552, the UNSC's largest military installation, the planet Reach, was discovered and invaded by the Covenant. During the entire course of the conflict, the UNSC followed the Cole Protocol, which declared that no UNSC vessel targeted by the Covenant was to retreat to Earth, as a means of ensuring the secrecy and security of the planet's location. In nearly twenty-seven years of galactic warfare, the Covenant never succeeded in determining the location of Earth through the measures taken under the Cole Protocol. However, by September, 2552, Earth was humanity's last major stronghold in its war against the Covenant. Despite the effectiveness of this law, on October 20, 2552, the Covenant launched their first attack upon Earth, rendering the Cole Protocol moot and initiating the final confrontation between UNSC forces and the Covenant. Prior to the Covenant invasion of Earth, there had been a suppressed influx of information by ONI, resulting in people going about their normal lives even up until the attack. The forces stationed at Earth were heavy, with the Second Fleet, Seventh Fleet, the Sixteenth Fleet and the 6th Battle Group along with large amounts of Marines, Army Troopers, and ODSTs present, five SPARTAN-IIs, Admiral Hood and Earth's most prominent means of defense, three hundred Orbital Defense Platforms, each sporting a Mk. V "Super" MAC. Also, there were numerous human colonies on various moons, a large naval shipyard and factories at Mars, and a listening post at Io. On September 5, 2552, after UNSC Gettysburg arrived on Earth to warn them of the imminent invasion, the UNSC recalled all surviving fleets, including the Third Fleet and Epsilon Eridani Fleet, back into Earth and consolidated them into the UNSC Home Fleet. The Battle of Earth rages above the planet in 2552, having finally been discovered by the Covenant after nearly thirty years of warfare. "The entire population of Earth was cut in half as the first battle of Earth began..."
On October 20, 2552, the first Covenant forces entered the Sol system. A Covenant expeditionary force consisting of battlecruisers and assault carriers arrived in system, first detected around Io, the third largest moon of Jupiter. After the existence of the Covenant presence was confirmed by probes, the UNSC forces went to full alert. The option was taken to wait for the Covenant forces to come to them rather than let Fleet Admiral Harper launch a counter attack. The Covenant began to work on punching a hole through the orbital defenses by taking out the stations in the battle cluster above the Mediterranean Sea via bombs planted by boarding parties. After the Covenant fleet attempted to rush through the newly formed gap the UNSC fleet annihilated them, destroying most of the Covenant battlecruisers but failing to destroy the assault carriers. One of the assault carriers was successfully destroyed by SPARTAN-II John-117 but the other, commanded by the High Prophet of Regret assaulted the city of Mombasa in Kenya. Groundside, the Covenant assault carrier had already deployed its ground forces and occupied the city. The Covenant ground forces immediately constructed defense emplacements and structures to reinforce their newly-acquired sites against the counter-offensive UNSC forces. The UNSC In Amber Clad was the first UNSC ship to respond to the Covenant occupation. The ship sent in their complements consisting of SPARTAN-II John-117, Sergeant Avery Johnson and elements of the 7th Orbital Drop Shock Trooper Battalion. The Covenant were subsequently dislodged from Old Mombasa and, following the destruction of a Type-47A Scarab, from New Mombasa as well. The High Prophet of Regret eventually ordered a general retreat and had his assault carrier initiate a slipspace jump while still over the city. The In Amber Clad followed in the carrier's wake, while the city was left in chaos. The Covenant returned in force following the Prophet of Regret's abortive attack and Covenant assault forces succeeded in penetrating the orbital defenses. At Mount Erebus, the sea floor off of the Yucatan Peninsula, and at the Centennial Orbital Elevator in Havana, Cuba, the Covenant were stymied by the three SPARTAN-IIs of Blue Team, who were re-deployed to Onyx soon after. The Covenant deployed their forces all across Earth, striking at major cities such as Cleveland, Ohio; but this attack too was repulsed through the efforts of ODST forces and the self-sacrifice of Colonel James Ackerson. The Covenant also attacked Sydney, home of the UNSC Headquarters, HIGHCOM Facility Bravo-6. Fortunately, despite the enormous damage inflicted on the city, the UNSC HQ survived completely unharmed, owing to its underground facilities. However, UNSC forces were unable to repulse and route Covenant landings in Kenya. After breaking Earth's space defenses, the Covenant bombarded Earth in Eastern Africa. The Covenant eventually succeeded in eradicating Mombasa and uncovering their primary target: The Portal. The arrival in-system of SPARTAN-117 in a Covenant-controlled Forerunner Dreadnought, freshly escaped from the Battle of Installation 05, was unexpected. SPARTAN-117 disembarked from the dreadnought in Earth's atmosphere, later recovered by Marines and taken to Crow's Nest. With the aid of the Arbiter, Commander Miranda Keyes, and Sergeant Avery Johnson, SPARTAN-117 breached the Covenant anti-air defenses near the excavated artifact, clearing the way for an aerial strike on the Dreadnought powering it. The strike was unable to disable the device or prevent the Prophet of Truth from traveling through the portal. After a brief intervention by the Flood a joint Sangheili/UNSC force departed through the portal in pursuit. This series of events saw the complete departure of the Covenant from Earth as they ventured forth to Installation 00, where they would finally be crushed by the UNSC and their Covenant separatist allies. UNSC Infinity undergoing a refit in a naval yard above Earth. Following the victory at the Battle of Earth and the Battle of Installation 00, the Human-Covenant War officially came to an end in March of 2553. 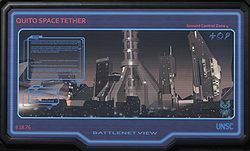 Many of Earth's cities were left in ruins and the planet's population was sharply reduced as a result of the Covenant invasion. With the war's end, the UEG began to rebuild from the extensive damage inflicted upon the planet's infrastructure and human population. Planetary governance was formally transferred back to the UEG from the UNSC. Only two years after the end of the war, Earth faced yet another invasion, this time led not by a hostile alien hegemony, but a Forerunner ancilla, 000 Tragic Solitude, the monitor of Installation 00. As a means to repair the Ark and to get revenge on humans for damaging it, the monitor tricked the UNSC into opening the portal which allowed him to send thousands of Retriever Sentinels to mine Earth for raw resources. The sentinels were engaged by the Home Fleet, which lost at least ten ships in the ensuing battle. Tragic Solitude's plans were thwarted by a joint UNSC and Swords of Sanghelios team on the Ark itself. In the postwar rebuilding period, Earth saw an influx of asylum seekers from the remnants of the Covenant. The admittance of such alien races fueled a security crisis on Earth and UEG authorities were tasked with preventing violent dissidents among these alien refugees from carrying out attacks against the human population. One such incident was a foiled threat of nuclear bombing in Rio de Janeiro. The Didact's flagship fires the Composer on New Phoenix on Earth in 2557. In July 2557, the Forerunner known as the Didact arrived in-system aboard his flagship, the Mantle's Approach, planning to use a device known as the Composer to enslave humanity. Having been forewarned by Commander Thomas Lasky of the UNSC Infinity, who was later promoted to Captain to take command of Infinity and replace Captain Andrew Del Rio, the UNSC Home Fleet was ready and led by the Infinity, along with Battle Group Dakota engaged Mantle's Approach. Meanwhile, Master Chief John-117 had stowed aboard the Mantle's Approach and with help from the Infinity, boarded the ship. Before the Master Chief could stop the Didact, the Composer began to fire on New Phoenix, Arizona, digitizing its entire population. John-117 eventually destroyed the ship with a nuclear device, ending the threat of the Didact and the Composer for the time being. In 2558, Cortana reemerged as the self-proclaimed leader of the Created, a collective alliance of human and Forerunner AI constructs whose aim was to enforce the Mantle by bringing the entire galaxy under the control of AIs. This plan called for several Guardians to be deployed across the galaxy to systematically disable all technology across human space. One such Guardian was deployed to Earth, prompting the intervention of the UNSC Home Fleet led by the UNSC Infinity. Unfortunately, the Guardian proved too powerful for even the Infinity and the vessel was forced to abandon Earth for deep space. All technology on Earth and all vessels in the Home Fleet were then disabled by the Guardian, bringing humanity's homeworld under Cortana's control as the UNSC scrambled to find a solution to the invasion. Planetside, Earth has seven continents of extremely varied climates and cultures. 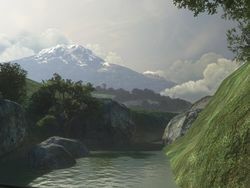 Mount Kilimanjaro as viewed from a Kenyan river in 2552. Diego Garcia - Island in the Indian Ocean and a major UNSC base. Mombasa - Major African city that was the first landing site of Covenant forces on Earth, destroyed in ensuing attack and retreat during the Battle of Earth. Tsavo Highway - An overpass highway bridging Voi, Mombasa, Arusha, and other cities together. Wind Power Station 7 - Decommissioned wind wheel which was acquired by the UNSC as Spartan training grounds. The Australian city of Sydney, home of the UNSC Headquarters, pictured prior to the Covenant invasion in 2552. HIGHCOM Facility Bravo-6 - Home of HIGHCOM and HQ of the UNSC. Sydney Synthetic Intellect Institute - AI research institute. Aranuka Space Tether - One of six space elevators on Earth. Special Warfare Center - Testing and training area, famous for testing the MJOLNIR MK VI and the C and V variants. The deserted city streets of New Phoenix in 2557; its terraced urban architecture reflects that of other worlds such as Reach. New Phoenix, Arizona - A city whose population was composed by the Didact in 2557. Chawla Base - An ONI base that housed the deep-space artifact. Cleveland - Target of a Covenant attack during the Battle of Earth. Greater Chicago Industrial Zone - A vast metropolis covering the former US states of Illinois, Wisconsin and Indiana. New York City - The Morelli family all live or were born here. Mark Twain, Missouri - Birthplace of Admiral Preston Cole. Base Segundo Terra - Used as the staging area to attack the Covenant incursions on Havana and the Yucatan Peninsula. Centennial Orbital Elevator - A 200 year old space elevator that was destroyed during the Battle of Earth. Quito - Home to the Quito Space Tether, one of Earth's six Space Elevators. Mount Erebus - Site of a Covenant attack during the Battle of Earth. Athens Station - An ODP defending Earth, destroyed by boarders in the Battle of Earth. Cairo Station - An ODP defending Earth. It was the command center of Earth's defense by Admiral Hood. Malta Station - An ODP defending Earth, destroyed by boarders in the Battle of Earth. Nassau Station - An ODP defending Earth. Oaxaca Station - An ODP defending Earth. Station Wayward Rest - Termination point of the Centennial Orbital Elevator. Destroyed during the Battle of Earth. Orbital defense platform Cairo in geosynchronous orbit around Earth. Earth as seen from Cairo Station, with the orbital defense grid and Home Fleet in view. The severed frigate UNSC Forward Unto Dawn seen falling towards Earth orbit in 2552. The UNSC In Amber Clad descends into Earth orbit in 2552. The Ur-Didact fires the Composer upon Earth in 2557. The outer perimeter of Wind Power Station 7 on Zanzibar Island, Tanzania, marked by the remains of traditional architecture of Ancient Africa. The American city of New Phoenix, Arizona in the United Republic of North America in the year 2557. The streets of New Phoenix, reflecting the terraced architecture characteristic of humanity in the 26th century. Centuries-old architecture in Old Mombasa. Factories in the African city of Voi prior to its glassing in 2552. The Portal, buried thousands of years on Earth, unveiled by the Covenant. A size comparison of Earth, Mercury, Venus and Mars. The Moon, Earth's one natural satellite and a major population center. "Fight For Her"; a poster rallies the UNSC to defend Earth, as seen on the UNSC Pillar of Autumn. ↑ 2.0 2.1 Twitter: @HaloWaypoint Hey, what was the population of Earth prior to November 2552?